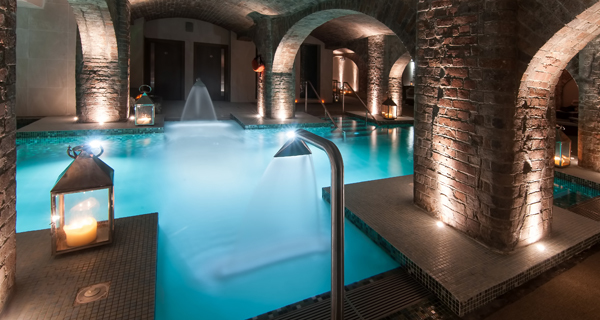 The Spa at Titanic Hotel Liverpool opened in March 2015. 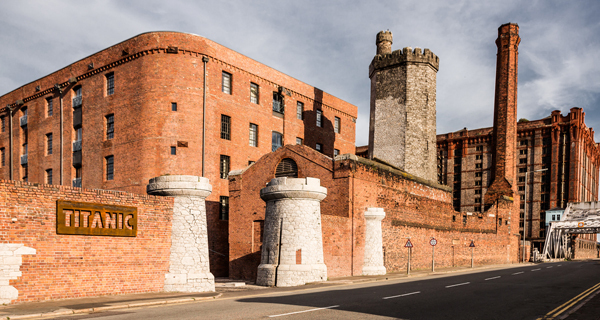 Titanic is just five minutes’ drive from Albert Dock and central Liverpool, you’ll head north passing traditional dockside warehouses before arriving at the hotel. 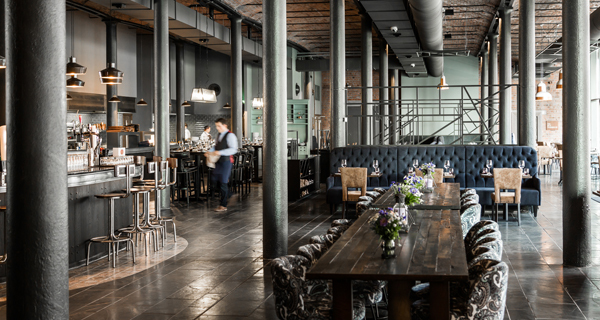 Titanic is a four star hotel that makes the most of its history as a rum and tobacco warehouse in Victorian Britain. The sheer size of the hotel, the metal fretwork, and the open space reception and bar could make it feel a little empty and soulless, but the unregimented and eclectic interior design softens the space down and makes it feel accessible. We saw family groups with young children or older grandparents as well as well-heeled locals during our time at the hotel. Descend to the basement and you’ll find a den of spa delight. If you spa to cocoon away from the world, The Spa at Titanic Hotel might just be your perfect hideaway. 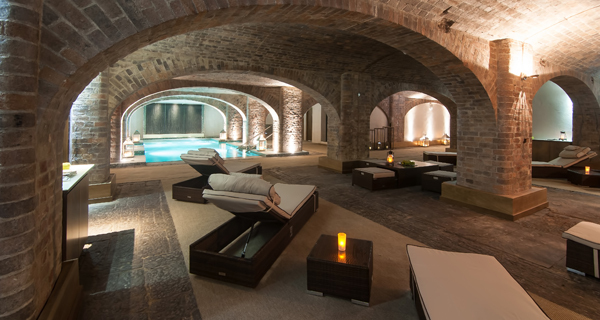 The spa uses the original brickwork from the changing room flooring which has been worn down by thousands of footsteps, to the dramatic archways in the hydro-pool area. You’ll even find peeks of exposed brickwork in the treatment rooms and sanarium. The space is kept very dark and is heated to a balmy 35 degrees, so it feels like a very primal relaxation space. The centre point of the room is the very modern, very warm hydro pool. There are swan jets and bubbles a plenty, and because spa numbers are kept low you should be able to get a slot to yourself, we were lucky enough to visit on a day where we could have the whole pool to ourselves. Next to the pool is the steam (beautifully hot), sauna (rather petit) and sanarium (light and bright). There are also two experience showers, two footbaths and two doors leading off to the small, but well stocked changing rooms. Around the edge of the pool are the treatment rooms. The sliding doors are perhaps not the most sound-proof, but they do create a lovely, large treatment space; no squeezing past your therapist as you try to lie down. The main product house of the spa is Irish seaweed brand Voya. The rooms are decorated in sympathetic browns and greens invoking the brand and waterside connection. My therapist, Lisa, found me lounging by the pool and took me through to our treatment room. I was having the Tangle Me Up body wrap (60 minutes, £85). Lisa talked me through the different steps of the treatment and started with some gentle body-rocking, just to introduce me to her touch. She uncovered my skin area by area, and used an abrasive body brush in short sharp strokes to exfoliate. She then used a hot cloth to remove the dead skin cells. Next she painted on the mask. A word of warning; seaweed is seaweed. To retain the properties of seaweed it needs to stay relatively pure, so the smell isn’t dampened by essential oils or perfume. The smell of the mask wasn’t particularly overpowering, but there was certainly an aroma in the air. Lisa wrapped me up in blankets and massaged my scalp while the mask worked its magic on my skin – bliss! She explained that I would need to shower to wash off the mask, and helped me up from the treatment bed, leaving me to shower in peace. Once I was resettled she came back into the room and massaged a moisturiser into my skin. After the treatment Lisa brought me a glass of water and took me back to my poolside lounger. Entrance to the spa is booked in two hour time slots, so if you are visiting to have a treatment you’ll then have two hours to enjoy the facilities. Two hours felt enough, especially in such a warm environment, but it wouldn’t make a full-day at the spa. If you’re feeling indulgent you might want to head upstairs to Stanley’s Bar and Grill for a dock-side afternoon tea. We did (we always opt for indulgent) and loved the fresh and light scones, delicious cakes and finger sandwiches. But you might also like to use it as an excuse to explore the local experiences… Are you a history buff, nature lover or shopping addict? There’s plenty to explore nearby.